6 volt, 4.5 Ah for Digital Camcorders and general purposes. Length 2.76", Width 1.85", Height 3.98" (Total Height 4.17", TAB terminals, Approx Weight 1 lb. Service Life Under Float Service @77°F. 4 to 6 Year. 2 Year Warranty under Float Service. NonFloat Service / 1 Year Warranty. Guaranteed to meet or exceed OEM specifications and performance. All Batteries are 90% charged when shipped. For most applications, we recommend you complete charging before use. Back Up Systems automatically bring the batteries to complete charge. All Tempest batteries are new. We do not sell refurbished batteries. Please VERIFY size & specification match your original battery. Click here for detailed specifications. BatterySpec sells Tempest brand batteries. Batteries of other manufacturers are listed for cross reference information only. 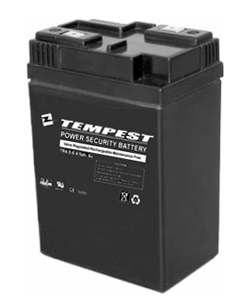 BatterySpec is neither affiliated with, authorized by, licensed by, distributors for, nor related in any way to any battery manufacturer other than Tempest. All other brands or products names, marks and logos are trademarks or registered trademarks of their respective companies.